There's new footage of a massive 20-foot-long great white shark believed to be the largest of its kind in the world. Shark researcher Mauricio Hoyos Padilla captured the footage of the shark named Deep Blue off Mexico's Guadalupe Island in 2013. The video was posted online Aug. 10, ABC News reports, but it's unclear why it was not published for two years. The clip shows the predator swimming near researchers in steel cages. One researcher is bold enough to swim outside the protection of the metal bars near the shark. He wasn't harmed. Hoyos Padilla clarified on Facebook that leaving the cage is no longer allowed. At the end of the clip, the shark bumps into one of the cages with her nose and shows off her razor-sharp teeth. Yikes! 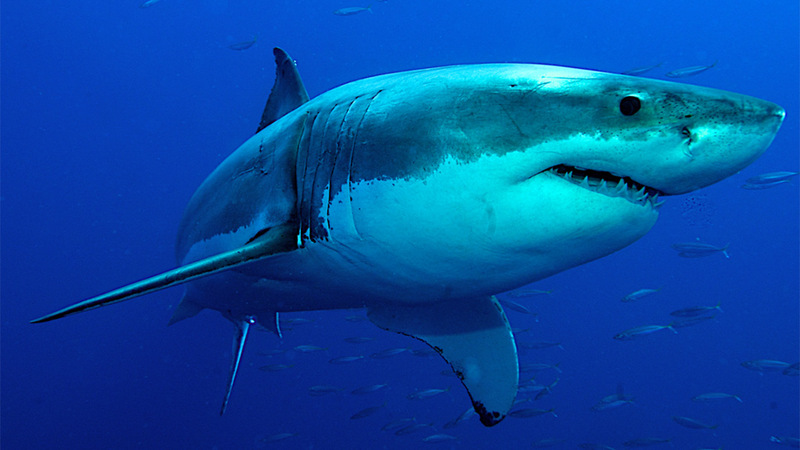 Great whites typically grow to 15 feet in length and weight up to 5,000 pounds. Ones as long as Deep Blue are rare, according to National Geographic. So why is Deep Blue so big? One reason is the shark's age. Researchers says she's at least 50 years old. Another factor: She was likely pregnant when this video was taken. The shark's age is cause for optimism, Hoyos Padilla wrote in a fundraising presentation for his marine conservation organization, Pelagios Kakunja. "When I saw Deep Blue for the first time, there was just one thought in my mind: Hope," he wrote. "A shark of that size is at least 50 years old and that tells me protection and conservation efforts are really working." Deep Blue was featured last year in a Discovery Channel documentary when researchers tagged the gigantic fish.